HOLLYWOOD has the Oscars, Britain the BAFTAs, and Frome has the Star Awards when the Frome Musical Theatre Company rewards its outstanding performers of the last year. Best Comic Performance: Dora Bishop & Simon Joyce. Best Young Female Performer: Astrid Bishop. Best Young Male Performer: Oli Wareham. Best Newcomer: Django Lewis-Clark. Unsung Hero: Gill Barnes. Best Female Singing Performance: Nicole Wooldridge. 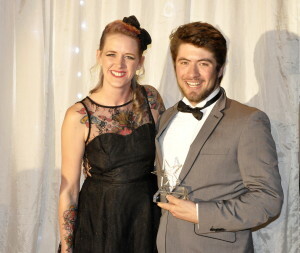 Best Male Singing Performance: Davey Evans. Best Supporting Actress: Nicole Wooldridge. Best Supporting Actor: Ryan Hughes. Outstanding Contribution: Ellen Bishop. Best Actress: Joanne Plenty. Best Actor: Ben Hardy-Phillips. Members’ Award of Appreciation: Joanne Plenty. Best Overall Performance: Ben Hardy-Phillips. The awards ceremony precedes this year’s spring production, Hairspray, in which singing performance award-winner Nicole Woodridge will play the lead of Tracy Turnblad. The show will run from 12th – 16th May, and tickets are now available from Frome Memorial Theatre box office at www.fromememorialtheatre.org.uk or 01373 462795. The FMTC extend their thanks to the main sponsors The Little Flower Company, and to all other sponsors of the event.